Welcome Back to the last day of Sneaks!! This set is adorable and can be used for a couple of different Holidays, wait until you see!! 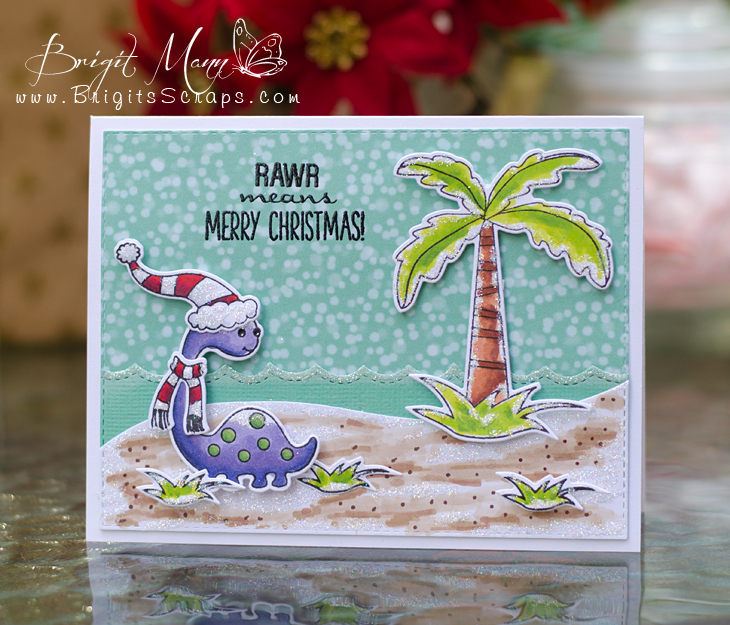 I wanted to create a Prehistoric Christmas card scene using some white glitter as snow banks on a sandy beach created with markers. Fantastic card! This little Dino is full of cuteness! Such a very cute card! Love this dino.... he's adorable and I love how you created a snowy scene on the land.... looks like snow is really starting to stick and coat! Great job! TFS! AWWWW What a Dynomite card you did an outstanding creative job!! Your scene is so adoRAWRable!! You so came up with such clever and creative ideas to create your snowy look..I love it and soooo can't wait to get this. YOU ROCK!! What a sweet winter card! Very cute card...puts a smile on my face. Love the snow falling in the background at the beach, awesome. Love your snowy beach! Fabulous Christmas card. I like your snowy beach scene. Such a darling Christmas card! I love the beach scene! What a fabulous release! What an awesome scene you've created for your dino! Perfect! Your dinosaur, tucked into his wintry scene, is absolutely adorable! The toque (yep, I'm Canadian) and scarf are darling! Love this! Cute and unique christmas card! OMG this is way to cute. Great design. Love it. I love the coloring and glitter on your fun Christmas card. Your beach scene is too cute. awwwwe take me to the beach for Christmas any time!!! love it!!!! Absolutely LOVE your card! Your background scene is fantastic! I love how soft the glitter looks on everything! A-MAZ-ING! You did a great job colouring everything too! LOVE this little dinosaur. Fabulous card,Brigit!! Love the glitter!!! What a sweet and fun card!! Love the colors and glitter! Your coloring is really terrific! I really like that you made the waves with the wave die in the background cause it makes it look like possibly a little storm is kicking up. The glitter snow really adds to the effect and your beach made with markers make me wish I could be that good! LOl I like the purple dino, he looks like Fred FLinstone's Dino! SO cute! Yabbadabbadoo! Can't forget the snow coming down on top of it all. Great job TFS adnilttoh@gmail.com versatile for Christmas! Brigit ~ oh my word this is AMAZING too! I LVOE the winter beach theme and oh my your coloring is AMAZING! Plus I want that background paper too! LOL! FABULOUS as always! That card is just too adorable!! Cute card! This week of sneaky peeks has been awesome. Great secen card - how the cute dinosaur looks startled,by the snow. What a cutie. Thanks for sharing your dino card. Wowee! Your details are just amazing! This is so cute Brigit! Love it! WOW! What a fabulous detailed card! Love all the glistening snow and the super cute santa hat! TFS Brigit! An island Christmas with the dinosaurs. It's awesome. love your dinosaur card! I really want to learn how to color like you do on your card. Its an awesome job. I love this card. The dinosaur is awesome!